Noah was born in East Gippsland, but was airlifted to a Melbourne hospital soon after his birth. “He had a really difficult birth and he struggled with brain damage from his birth, due to a lack of oxygen,” Ms Lea said. “He was fighting against the machines. He just wasn’t interested in being here under these circumstances. Ms Lea and her partner Russell Osborne had time to say goodbye to Noah in hospital thanks to a ‘cuddle cot’. The device, a refrigerated unit that cools the base of a basinet, enables the body of a baby, or babies, to be safely stored within a decorated cot. Ms Lea is now dedicated to raising funds for a community cuddle cot in East Gippsland, available for use by families in eastern Victoria. A cold Cuddle Cot bassinet and cooling machine. Ms Lea is raising funds for a cuddle cot, like this one. Her fundraising method is unique in that she is planning a Charity Camel Trek in October with the dual purpose of raising awareness and money. Ms Lea has named the trek Camels for Cuddles. “When a parent experiences a baby loss, they can have their baby in this cuddle cot for seven to 10 days to say final goodbyes and to admire the baby they grew and take some time,” Ms Lea said. “It gives parents days rather than hours with their baby [and] it could be a stillborn baby or a neonatal death. “Our experience with Noah in December 2015 was that we had a cuddle cot but we were in a Melbourne hospital. Ms Lea originally met her partner Mr Osborne on a camel trek through the outback. Having grown up on a farm with cattle and horses, her affinity with camels came easily. “I was travelling around Australia at the time with my kids and came across a station [that] had cattle and sheep,” Ms Lea said. “I’d heard about this camel man and thought ‘Aw yeah, stinky camels’,” Ms Lea told ABC Local Radio earlier this year. 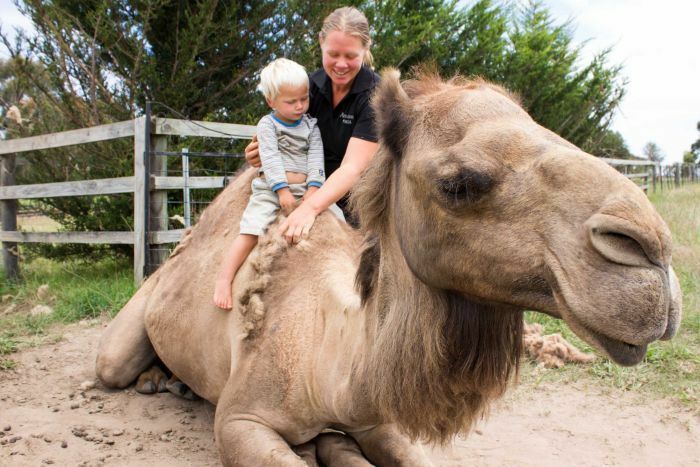 After their outback adventure, the camels were brought to live in East Gippsland and in January this year, they began their career as a beach ride attraction. Locals in Nicholson are slowly becoming used to seeing camels in the paddock next door and Ms Lea said incorporating the camels into her fundraising mission was an obvious link. “The community will remember camels; it couldn’t be in the outback, it had to be in this community for this community,” she said. Ms Lea said she had already received lots of support from people in East Gippsland, and from those further afield. “When we started our Lakes Entrance camel rides in January this year, a few weeks after starting we wanted to do a fundraising for [volunteer organisation] Heartfelt, who take photos of new born babies who are critically ill,” she said. “We had Heartfelt come to us twice — once when the kids were there and then on Noah’s passing hour. They are photos we will keep forever. “I had parents come up to me and they had a similar experiences. With support from the Emerikus Land Foundation charity, Ms Lea will complete her fundraising camel trek in October.